"In the complex movement of renaissance thought in Western India since 1818, Gopal Ganesh Agarkar’s ideas marked the apex of the rationalist strand. Agarkar was a serious student of European Enlightenment and was deeply influenced by the Utilitarian and skeptical writings of 18th and 19th century Western thinkers, especially John Stuart Mill, Herbert Spencer, August Comte, Thomas Huxley, John Morley and Edward Gibbon. Indeed, he was not ignorant of Indian classical lore. But it was the Western liberal—rational thought and the secular— scientific world-view that it represented which made intense appeal to his resilient mind. What he recognised was the revolutionary character of the rational principles, which are timeless and universal, as evolved by the Western rationalists." 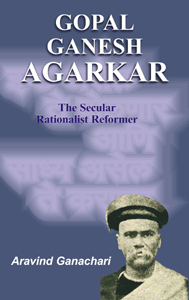 In this book the author makes an in-depth study of Agarkar’s rationalist ideas in social, political, economic and other related fields that are accurately reflected in his numerous writings, first as the editor of Kesari (1881-87) and later as the founder – editor of Sudharak (1887-95). The author examines how Agarkar wanted reason and an enlightened conscience to be the sole determinant in regulating human conduct and social behaviour. His rational approach constantly re-examined all social ideas and institutions – whether they served the purpose of social utility and comfort or not. He was among the few contemporaries in whose thought and practice there was no dichotomy. "Education, not just formal but also Lokshikshan," Agarkar said, "holds key to advancement in life. He not only preached but followed: “Persuade, argue, cherish virtuous examples; bring up the youth in the habit of right opinion and right motive, shape your social arrangements so as to stimulate the best part of character”. It is becoming increasingly difficult for individuals who have the courage of conviction to criticize politicians in power and demolish myths which influence the general public. In such an atmosphere it becomes necessary to revive the memory of Agarkar, a solitary rationalist, who fearlessly expressed his dissenting opinions and helped his contemporaries to learn by discussions and arguments. As a rationalist, secularist, and humanist – you may call anything – this book is a must to know more about these concepts as well as how a person faced the problems in day-to-day life when he tries to adhere to his principles and convictions. The author has put the efforts to make the book to be understood by any lay man and aptly describes the details of the events occurred during Agarkar’s life. The book has been arranged in a very nice manner wherein the first chapter is devoted to what is rationalism, what is reason, what was the situation in the late nineteenth century in Maharashtra. The second chapter is about the life sketch of Agarkar. The third chapter includes details about how Agarkar became rationalist, who influenced him, what books he used to read etc. Agarkar’s literary works are described in the next chapter. Agarkar wrote mainly in Marathi. विकारविलसित is a play in Marathi, the translated version of original Shakespeare’s play on Hamlet. डोंग्रीच्या तुरुंगातील आमचे एकशे एक दिवस (Our 101 days in Dongri Prison) is a sort of prison diary of Agarkar who spent 101 days in jail along with Lokmanya Tilak who were sentenced for writing the editorial in Kesari daily and had to face a defamation case. The editorials written by Agarkar in Keasri have been compiled and published in two volumes. Agarkar also wrote scholarly books on Marathi grammar analyzing the structure of sentences. विविध विषय संग्रह is collection of Agarkar’s miscellaneous writings. He also translated a book from Gujarati to Marathi शेठ माधवदास रघुनाथदास यांचे आत्मलिखित पुनर्विवाह. According to the author, Agarkar’s ideas in social, political, economic and the other related fields are accurately reflected in his numerous writings — first as the editor of Kesari (1881-1887) and later as the founder-editor of Sudharak (1887-1895). Himself an agnostic, he never denied the role that religion played in the certain stage of human development. However, he felt certain that with the growth of science and scientific knowledge, ethics will be separated from religion. He firmly believed in the persuasive power of reason in inducing people to think and overcome blind superstitious faith and to lead a wholesome life on the basis of rationality and equality. He wanted reason and enlightened conscience to the sole determinant in regulating human conduct and social behaviour. To him, no traditional idea, institution or custom was sacrosanct, and anything that was inimical to human progress had to be cast aside. The most important chapter in the book appears to be Critique of Hindu Society and Conception of Social Change which includes his ideas of social change, the method of reform and social issues. In fact during his brief life he had to confront issues like the age of consent controversy, on liberation of women, caste system, Sharada Sadan controversy, the panchhouda tea episode, Hindu - Muslim riots of 1893-94. The author had taken lots of pains to bring out Agarkar’s views by going through the published as well as unpublished papers available. He describes in detail the nature of the issues, the controversies, the people involved, their ulterior motives and how Agarkar tackled these issues. It appears that most of the time Agarkar was victimized by his one time friend, Lokmanya Tilak, who took advantage of sensitive nature of Agarkar. The next chapter is devoted on religion and morality. The author has summed up Agarkar’s views on liberalism, politics and economics in the next few chapters. He concludes the book by the article ‘Saint of Rationalism’. In one of the papers written by the author, he had emphasized how Agarkar differed with other contemporary social reformers on the question of ideology, and the method and manner in which the desired reform was to be attained. In his opinion, the word Sudharana was not just synonymous to ‘social reform’ but represented an all round human “progress”. He disagreed with other methods of social change, namely, The Mandlik School of Reform—’Reform from within’; the Telang School of Reform—’the line of least resistance’; the Method of Tradition—both Derivative (vyutpattikar) as well as Prarthana Samajists; breaking the continuity and forming a new sect; reform through social legislation; and the Method of Revolution. He preferred the Secular Rationalist Method of social change over other methods which he considered as gaun [The paper also attempts to spell-out what Agarkar meant by the Secular Rationalist Method. Agarkar firmly believed that social good presupposes a living, changing society; if the society does not keep itself in tune with the modern ideas based on rationality and equality, inevitably the forces of change would sweep away everything and bring about a revolutionary change similar to the French Revolution. While reading the book, one will always feel that Agarkar or persons like him should have been there in the present time to speak and act fearlessly against irrational behaviour of so called intellectuals, social reformers, politicians and educated elite. Thanks to the author as well publisher to bring out such a thought provoking book!